Admit it, who doesn't love a good fit-and-flare dress? With it's classic and universally flattering fit, skater dresses should be an essential in every woman's wardrobe. They're flirty, feminine and fun. There is such a variety of styles, sleeves, hem cuts, and colors that could keep us wearing skater dresses 365 days a year! A good skater dress has the power to communicate one's personality just upon entering a room. You have style, you don't take yourself too seriously, you know how to have a good time and you're a feminine boss babe who enjoys life to the fullest! That said, allow Dress Weights by Dress Strong to proudly introduce you to our top fit and flare dresses for every budget. Date night coming up? Grab this darling Elizabeth and James dress. It's classic hemline will keep those guys swooning during those city strolls in this dress. Stripes in varying widths make this Elizabeth and James flirty mini eye-catching. Dress up the day look with shimmering jewelry. If it's good enough for the Olsen twins, then it's good enough for us! They're New York City style icons - enough said. 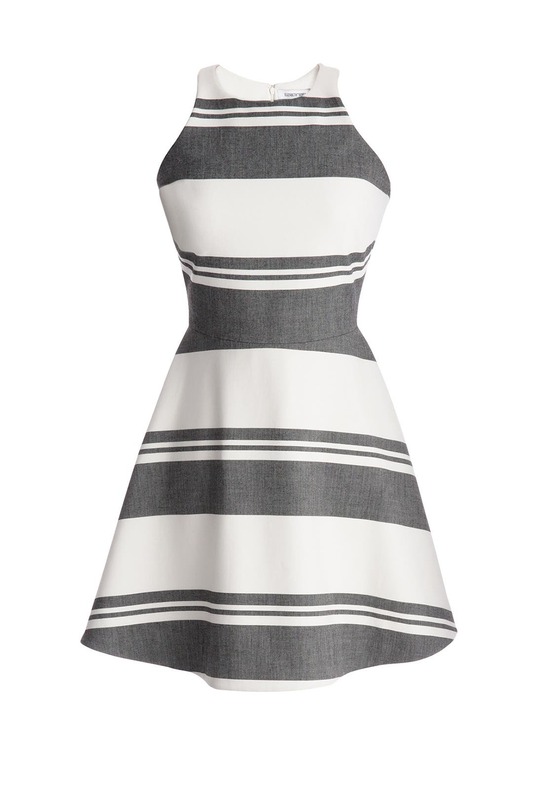 Have a small fortune to spend on the ultimate fit and flare dress? This dress is everything - it's classy, sassy and a little bit bad assy. 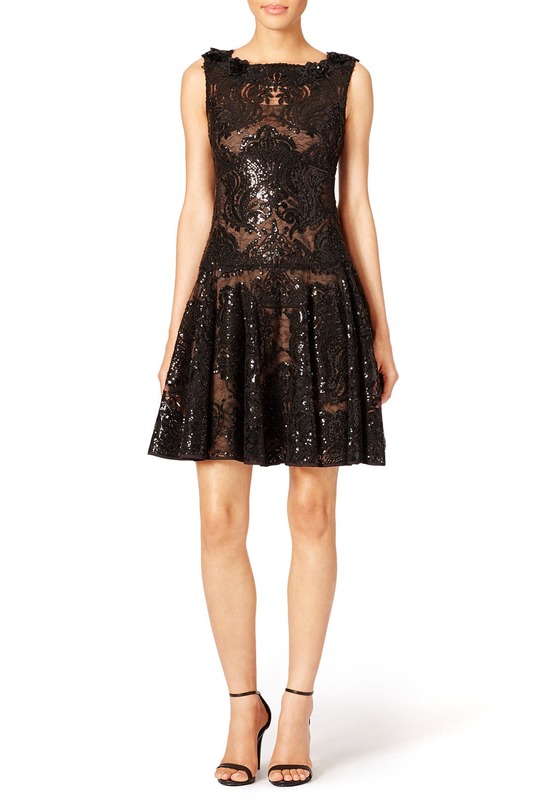 Add some shine to your night in this shimmering design by Marchesa Notte. Pair the festive look with simple heels and classic jewelry. Boom. The perfect skater dress is every stylish girl's must-have, and the Lulus Play On Curves Red Backless Dress is one you'll cherish forever! Skinny straps support a high rounded neckline as they crisscross and tie over an alluring open back with scalloped trim. Is it possible to swoon over a hem line? Guilty as charged! PS. It comes in 4 different colors! Thank us later. This pleated skater dress is as flattering as it is versatile, with scalloped trim to finish off this feminine look. This dress won't break the budget which means you'll have money left over for a set of DressWeights to keep those flowy dtress hems down on windy days! No more Marilyn Monroe moments! Is any list ever complete without the mention of Target? Step into The Notebook era and style yourself an old-romance-feels ensemble with the Floral Button-Front Ruffle Sleeve Dress from Mossimo Supply Co.™ Thin ruffle sleeves gently flutter atop your shoulders for dainty detail, and an open back adds the perfect dose of graceful flair. Whether you’re packing up a picnic lunch or enjoying a leisurely bike ride (with a basket in front, of course), you’ll exude nothing but romantic charm in this floral A-line dress. So there you have it. This list doesn't even begin to scratch the surface of the abundance of stylish, flirty, feminine skater dresses. They're universally flattering and will keep you feeling and looking good wherever the wind may take you!